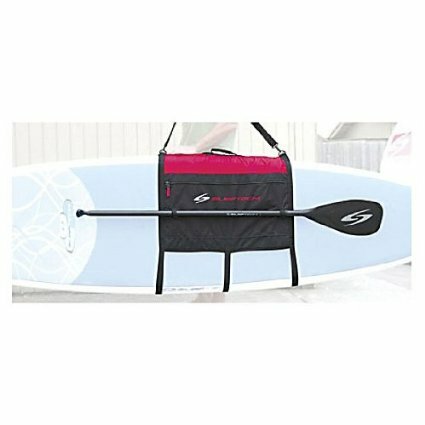 SUP carry accessories – Smart ways to get your board from vehile to water. – Smart ways to get your board from vehicle to water. 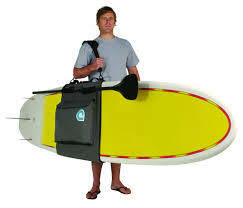 It didn't take long for creative minds to invent SUP carry accessories to transport stand up paddle boards distance. If you have to get your board from a parking lot, down a grassy knoll and over yards of sand you'll be happy know you have multiple options to aid in the process. Get ready to view SUP straps, slings and wheels below. 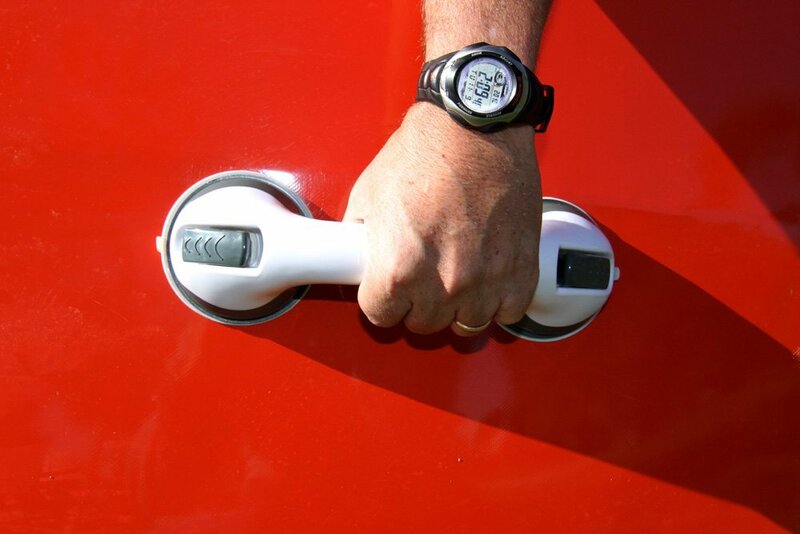 Using this handle on a windy day provides a much more secure hold. This is my BIG RAVE item for this spring 2014. This simple device has suddenly relieved me from the (sometimes) difficulties I get into packing my board on and off my vehicle by my self. I can now place this handle on the fin side of the board for easy pick-up off the ground and onto my truck. Once you find the perfect position on your board the whole process is much less effort simply because you can place the handle precisely where you need it. This is little device is an absolute gem! I'm buying another. See full review; SUP gear reviews. This accessory has a range from narrow strap with padded shoulder to wide board slings. Both are over the shoulder style with buckles for adjusting to your comfort level. Most of the weight is supported by ones shoulder. (match number to descriptor to see visual). Listed below is a sample of the styles available. 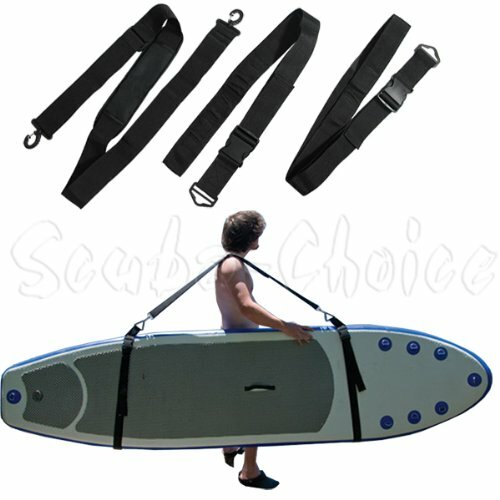 Easy way to carry your SUP long board without using a strap over your shoulder. This set of wheels can transport 2 SUPs at a time up to a maximum of 70 lbs. After transport fold down and take with you or leave behind and lock up with a standard bike lock. Walk holding the free end of the board to travel over sand and uneven terrain. Or add a bicycle accessory to the bike seat securing the free end of the board and your off. These wheels snap into the fin box and can be strapped to your board if you don't want to leave them behind. Supports up to 60lbs and can carry two boards at a maximum wideth so 31 inches. SUP board attaches to wheels with a 4 1/2 inch centre suction disc. 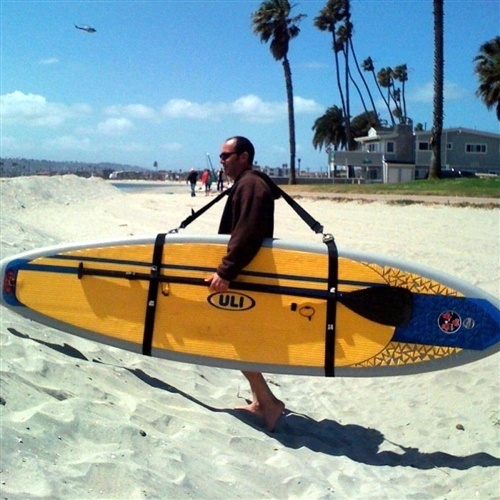 The SurfStow has a collapsible frame and utilizes grip handle suction cups for carrying the free end of the board. The wheels are 10" inflatable for smooth transport and includes 36 inch bungee and carry bag. A fabric nose piece for carrying or attaching to your bicycle. Wheel unit breaks down using quick release pins. Travel bag included. Quicer Kaddy holds up to 3 boards and clips to you bicycle. It can be pulled over sand. Interesting forum from StandUpZone all about building your own SUP carrier and other ideas for transporting.